About meI live in the the suburbs of Minneapolis, Minnesota. My hobbies are gardening, reading, music and cooking. I have a wonderful husband who reads but doesn't "get" LT. Huh? 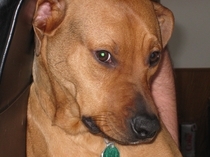 That cute mutt in my profile picture is Brix. He would rather lounge in the sun than read a book, but I love him anyway. Most of the books in my library are 20th and 21st century fiction along with a good selection of American and English poetry and fiction from earlier days. I have a more-sizable-than-expected gardening/environmental collection as well. I enjoy a good mystery, but usually end up donating those to the local library. I may seem rather capricious in the way in which I rate books, but my system makes sense - or at least it does to me. Generally, I rate like books against other like books. My rational for this is that standards for a spy novel are different from those for literary fiction, which is different from historical fiction, which is different from cookbooks or gardening books. So, If you see that both a mass market mystery and a Willa Cather book are rated with 4 stars, then just remember that I hold Cather to a different standard than the mystery writer. I think my collections are fairly self-explanatory. Then I'll add several subject tags, or other tags that signify something I found of interest in the book.